A new mountain biking centre has been launched with the help of SIS investment: Laggan Wolftrax in Strathmashie near Laggan. 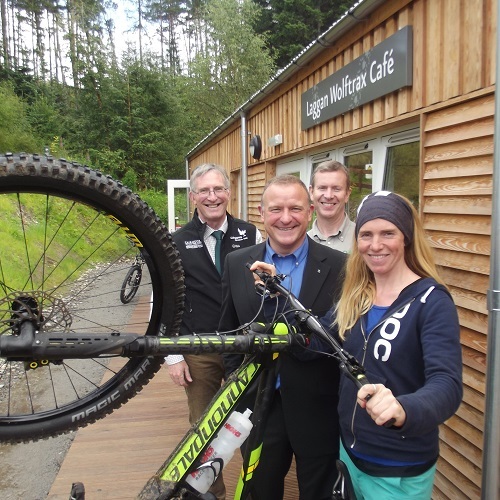 The centre has been set up as a social enterprise by Laggan Forest Trust, a charity with a trading arm, at Forestry Commission Scotland’s popular Laggan Wolftrax mountain bike trails. The new centre includes a bike shop offering hire, retail and repair services, a café and able to offer conference space and courses in orienteering, bike maintenance and first aid to local schools, colleges, community groups and the public. The facility has already created five new local jobs and it is hoped that it will help to attract many more visitors to the area to help raise the profile of mountain biking amongst young people. Laggan Wolftrax MTB Trails were constructed by Forestry Commission Scotland in 2004 and is regarded as one of the top trail destinations in the UK with 30km of mountain biking trails from gentle green runs to extreme black grade runs for the adventurous mountain biker. Use of the trails is free and attracts more than 14,000 visitors per year. The new centre was made possible thanks to investment from the Cairngorm National Park Authority (CNPA), who helped to fund the centre, and Social Investment Scotland (SIS) who provided investment for the café development. Clad in wood and situated adjacent at the foot of the mountain biking trails, the facility boasts wonderful views of the surrounding mountains.